Which apps are best for your classroom? So, you’ve decided to go down the mobile learning route: iPads or some other tablet in the hands of every pupil, and their teachers. Now the only question remains is: which apps are best? Well, I am not going to attempt to give you a definitive list of must-have apps, because that would be a whole book in itself! In a related post I’ve suggested 11 apps that I’d recommend you consider, and if you read that article you will note that I have very carefully selected mainly generic apps. The reason is simple: the ‘best’ set of apps will depend on factors such as the age range you teach, your budget, where you’re located and, therefore, the curriculum you follow, whether your pupils have particular special educational needs, and so on. So, you are left to your own devices: looking in apps stores, looking at “X best apps” articles on the web, and keeping your ear to the ground on Twitter and other social networks to find out what others are recommending. But that is all pretty time-consuming, and you would still have to go through some evaluating process before recommending that all one thousand (or whatever) tablets in your school have those apps installed. What can you do? The first thing to do is get back to basics. If you cut to the chase, apps are only any use if they either enhance learning or enhance teaching in some way. That is the bottom line. It’s easy to forget that, because so many apps are incredibly clever: it’s very easy to get carried away by all the bells and whistles. The best defence against that is the “so what?” question. After all, that is what an Ofsted inspector will be asking themselves in your lesson. Can it stretch the pupils? Can you customise it to better suit your pupils? Is it readable on the screen? Can it be deployed easily, ie en masse? Are there any age restriction limits? This is by no means a definitive list, of course, and you will find other criteria in my article at http://bit.ly/23factors. 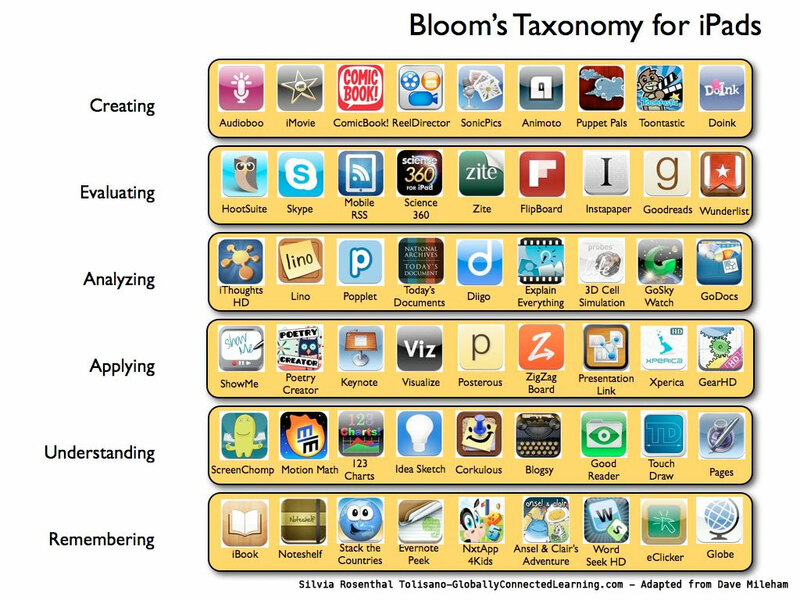 If you wish to take a more sophisticated approach which also has a practical element t it, you could try evaluating apps according to how well they address the aspects of Bloom’s Taxonomy. There is a very good example of that approach here: http://langwitches.org/blog/wp-content/uploads/2012/03/Bloom-iPads-Apps.jpg. Why not check out the apps there for a start? If you work with colleagues, you could divide the Bloom’s strands between you, and search for a few UK-oriented apps which will be suitable. Talking of colleagues, there are two resources which are absolutely crucial: other teachers, and your pupils. You don’t have to do all the work yourself! One approach, for example, is to allow teachers to buy, download and install the apps they like, at least up to a limit. This was an approach taken by Harrogate Grammar School (see http://edfutures.net/Harrogate_Grammar_School for a case study). After all, each teacher will have their own ways of working, and they can tell you, and other colleagues, which apps they find most useful. And, of course, there are the pupils. If they are old enough to be using a tablet at home, why not ask them which apps they use for school work – and how they use them? You might even wish to set up a competition for the best suggestions/ You may receive loads of brilliant recommendations for the cost of the prize of a book token – or a decent app!